By default, c = 0. The parameter c can be used to rescale y so that it is strictly positive. By default, g = 1. Alternatively, g can be , where is the geometric mean of y. 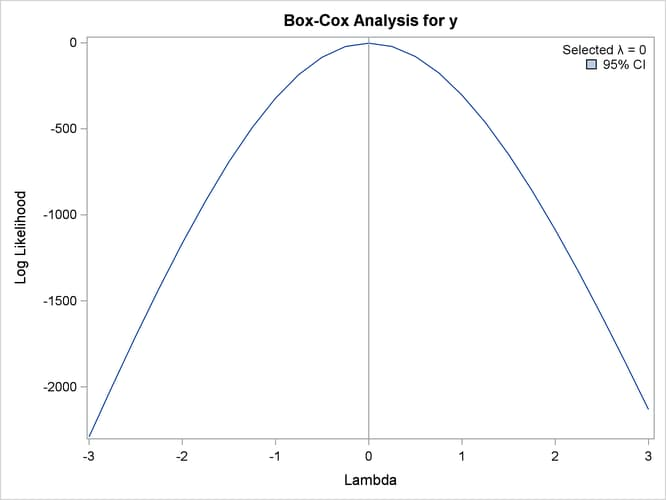 The BOXCOX transformation in PROC TRANSREG can be used to perform a Box-Cox transformation of the dependent variable. You can specify a list of power parameters by using the LAMBDA= t-option. By default, LAMBDA=–3 TO 3 BY 0.25. The procedure chooses the optimal power parameter by using a maximum likelihood criterion (Draper and Smith 1981, pp. 225–226). You can specify the PARAMETER= c transformation option when you want to shift the values of y, usually to avoid negatives. To divide by , specify the GEOMETRICMEAN t-option. LAMBDA= specifies a list of power parameters. PROC TRANSREG tries each power parameter in the list and picks the best transformation. A maximum likelihood approach (Draper and Smith 1981, pp. 225–226) is used. With Box-Cox transformations, PROC TRANSREG finds the transformation before the usual iterations begin. Note that this is quite different from PROC TRANSREG’s usual approach of iteratively finding optimal transformations with ordinary and alternating least squares. It is analogous to SMOOTH and PBSPLINE , which also find transformations before the iterations begin based on a criterion other than least squares. The default LAMBDA= list of –3 TO 3 BY 0.25 is used. The procedure prints the optimal power parameter, a confidence interval on the power parameter (based on the ALPHA= t-option), a "convenient" power parameter (selected from the CLL= t-option list), and the log likelihood for each power parameter tried (see Example 104.2). 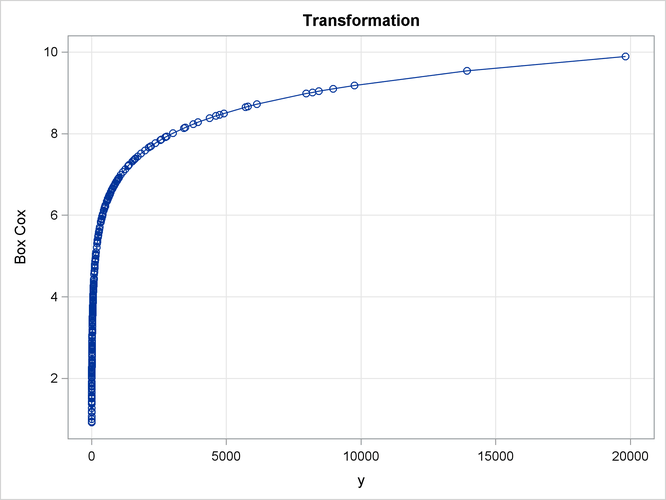 Figure 104.14 shows that PROC TRANSREG correctly selects the log transformation , with a narrow confidence interval. 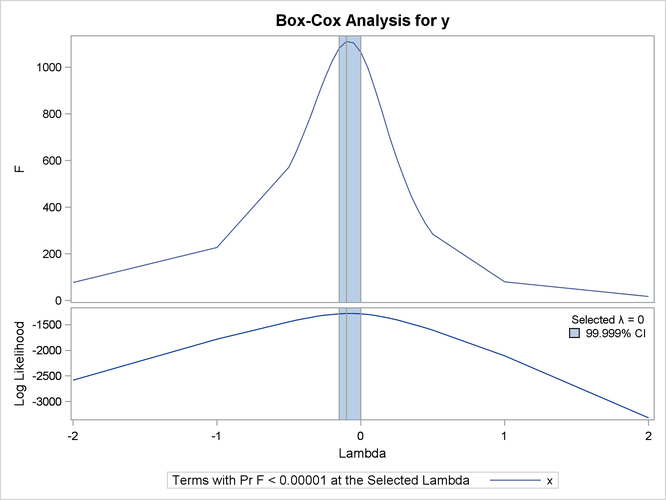 The plot shows that F is at its largest in the vicinity of the optimal Box-Cox transformation. 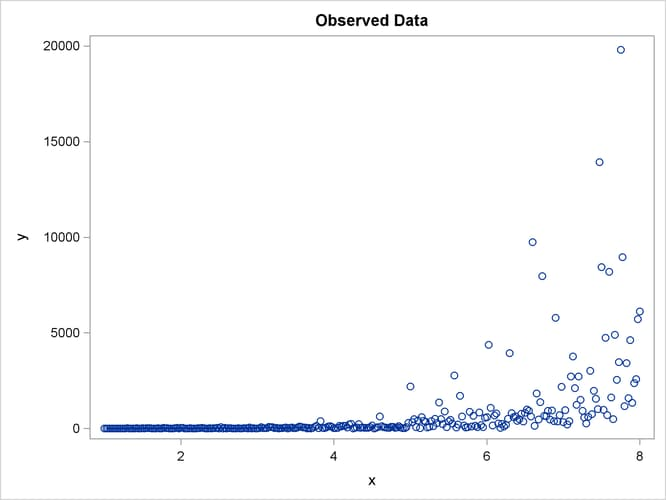 The rest of the output, which contains the ANOVA results, is shown in Figure 104.15. The above statistics are not adjusted for the fact that the dependent variable was transformed and so are generally liberal. This next example uses several options. 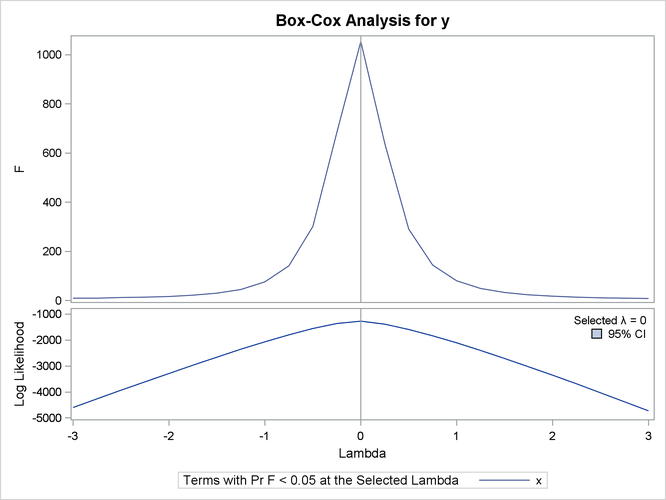 The LAMBDA= t-option specifies power parameters sparsely from –2 to –0.5 and 0.5 to 2 just to get the general shape of the log-likelihood function in that region. Between –0.5 and 0.5, more power parameters are tried. The CONVENIENT t-option is specified so that if a power parameter like or is found in the confidence interval, it is used instead of the optimal power parameter. PARAMETER=2 is specified to add 2 to each y before performing the transformations. ALPHA=0 .00001 specifies a wide confidence interval. 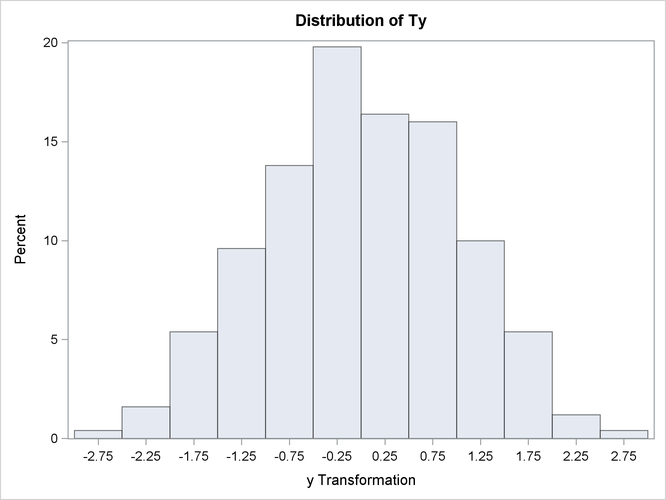 The results in Figure 104.16 and Figure 104.17 show that the optimal power parameter is –0.1, but 0 is in the confidence interval, and hence a log transformation is chosen. 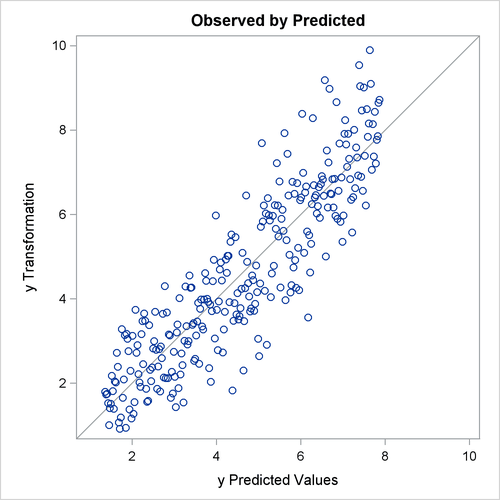 The actual Box-Cox transformation, the original scatter plot, and observed by predicted values plot are shown in Figure 104.17. The PROC TRANSREG results in Figure 104.18 show that zero is chosen for lambda, so a log transformation is chosen. 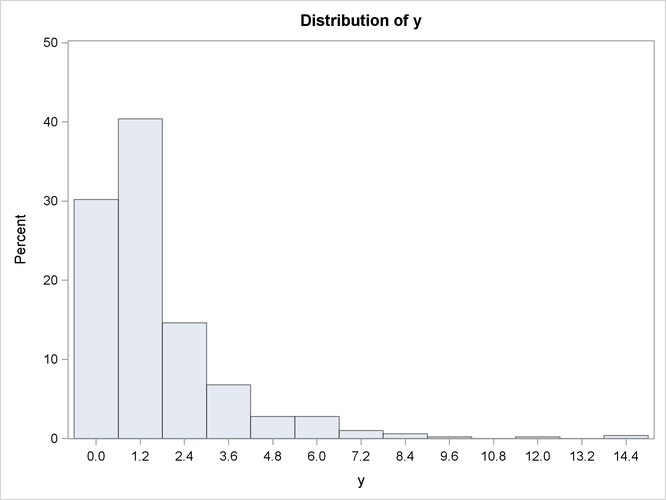 The first histogram shows that the original data are skewed, but a log transformation makes the data appear much more nearly normal.